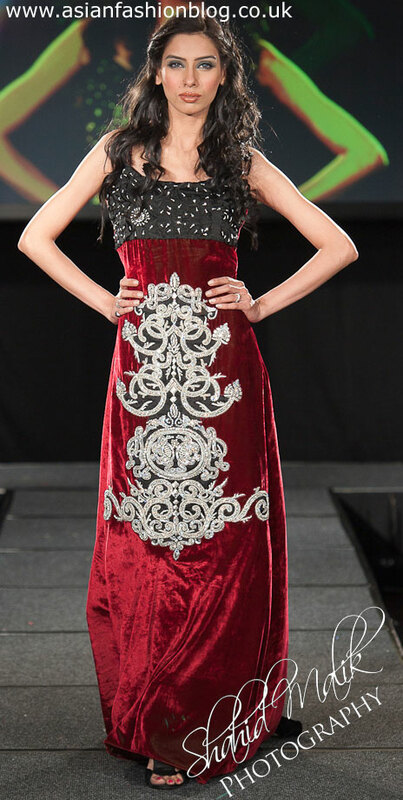 Here's the collection from Asim Jofa which was showcased on the catwalk at the 2011 Pakistan Fashion Extravaganza. This outfit stood out to me compared to all the others because it has the split going up the front. It's interesting how "plain" some of the outfits in this collection are, and by "plain" I mean not very heavily embroidered and in just one colour. The outfit on the right above is one example of this, as are the blue and yellow outfits from the start of the show. Personally if I was going to wear an outfit like this, I'd make sure I added some accessories. This collection is available to view and buy in the UK at O'nitaa in London, and when I visited the store a few months ago, this designer's work was highlighted to me because of the craftsmanship - there wasn't a single loose thread any of the outfits and the embroidery was finished to the highest standard so there wasn't that "sticky" effect you often get when embroidery sticks to other fabrics. You can find out more about Asim Jofa via the Asim Jofa Facebook Fanpage. A big thanks to Shahid Malik Photography for these photos. she is the authorized Canadian sales point and will ship. I got a suit shipped from her.